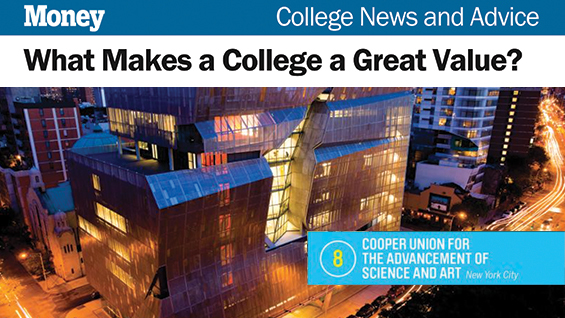 Cooper in Top Ten of Money Mag's 2016 "Best Colleges"
For the third consecutive year, Cooper Union was named to Money magazine’s Best Colleges for delivering value and preparing students for graduation. To make the cut, colleges are ranked on quality of education, affordability and alumni success (which includes both expected early- and mid-career income). Since the list first began in 2014, Cooper has been included in the top ten. Cooper also ranked fourth for Money’s list of best private colleges.